YouTube, Odeo, and other services that let you embed audio and video files on your website are great tools for bloggers. Need a funny video to emphasize a point you’re making? Just find one from YouTube. In fact, some web sites have based their entire business plan around finding the best videos from online video sites and reposting them in one central location. 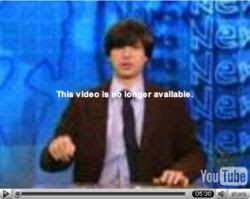 But there’s at least two problems with embedded videos. Many of the files uploaded to audio/video sharing sites are copyrighted files. If the user who uploaded the file didn’t have permission to post the song or video, you can be pretty sure that you don’t either. But are you liable for copyright infringing files if all you’re doing is linking to them? After all, when you’re embedding a YouTube video on your site, it’s still hosted on YouTube. You’re just pasting some HTML code that allows a visitor’s browser to watch the video without leaving your site. The Citizen Media Law Project takes a pretty detailed look at this question. In a nutshell, it’s hard to say. On the one hand, you’re incorporating copyrighted works into your site. Whether you know the items are copyrighted or not is beside the point. But because you’re not actually hosting the files, it’s possible that you’re not actually liable. After all, if you’re clearly linking to a YouTube video, it’s unlikely any but the most determined litigants will sue you when they could go after Google with its deep pockets. And if YouTube receives a legitimate takedown notice, they will remove the video, which effectively removes it from your site. In other words, it’s both a blessing and a curse that you have no control over videos once you’ve embedded the links on your site. Sure, you could be left with a hole in your blog post. But isn’t that a lot better than a hole in your wallet? Probably the best practice is to avoid linking to any materials that you know have been uploaded without the permission of their owners. The videos won’t suddenly go missing from your site one day, and more importantly, the law in this area is still very new and very subject to change. In the U.S website owners are protected by safe harbor laws — so if they host/link to copyrighted content then they are okay if they take it down when asked by the copyright holder. That is providing they linked to/hosted the copyright material in “good faith”. Google removes infringing links from its search engine on a regular basis when asked to by copyright holders. When a website refuses to take infringing links down that’s when the court cases ensue. I’ve discussed this a lot on webtvwire.com.